The Forest Town Community Council meets on the 3rd Tuesday of each month from 7:15pm at the Sherwood Room of the Forest Town Arena. THIS PAGE IS NOT CURRENTLY BEING UPDATED. FOR THE LATEST ABOUT THE FOREST TOWN COMMUNITY COUNCIL PLEASE CONTACT THE SECRETARY PHYLLIS GREGSON. 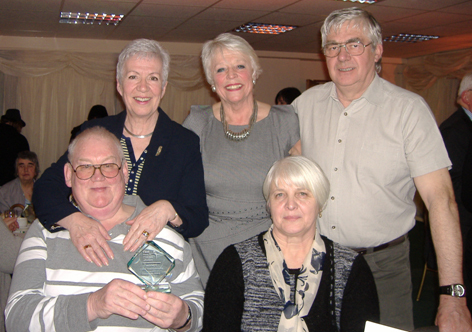 Committee members of the Community Council: Chair Syd Owen, seated left holding the award, treasurer Val Moss, vice-chair Jim Gregson and secretary, Phyllis Gregson pictured at the Chad Award ceremony with Mansfield District Counciilor and nominator of the group for the Award Cllr. Heather Henshaw. The event took place at the Chad Offices, Newgate Lane, Mansfield on 25th February 2011. 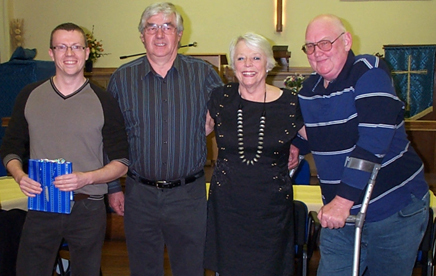 Read about the Forest Town Community Council meetings held in 2011. Read about the Forest Town Community Council Planning Sub-Committee. On the 24 March 2011 the Trinity Cafe at the Methodist Church hosted a Social Evening for members of the Community Council. To mark their retirement from Mansfield District Council, FTCC Chair Syd Owen presented Cllr. Heather Henshaw with a powder compact and FTCC Vice-chair Jim Gregson presented Cllr. Alistair Windeatt with a pen in recognition of their service to Forest Town. Members of Forest Town Community Council enjoying the Social Evening hosted by the Trinity Cafe (photo 2nd left, bottom row) at the Methodist Church in Forest Town.